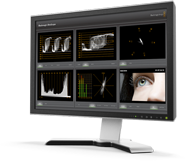 Matrix UAB is selling all Blackmagic Design products since year 2007 and provides video editing solutions. The most popular video products we keep in local stock. Here is a short list of the products. 2.5K digital film camera with super wide 13 stops of dynamic range for a true film look! Includes DaVinci Resolve, and Includes UltraScope ! Blackmagic Cinema Camera features a built-in SSD recorder that allows 2.5K uncompressed CinemaDNG RAW 12-bit capture as well as Apple ProRes and Avid DNxHD compressed video formats. All file formats are open standard and used by NLE software so you get the only camera designed from the ground up to be part of a whole post production workflow! Available in two models: with ZEISS Planar T* 50/T1.4 ZE lens for EF mount , or with Voigtlander f/0.95 25mm MFT Nokton lens. The world's most advanced range of broadcast quality 1 M/E and 2 M/E live production switchers. Connect SDI and HDMI cameras to switchers with talkback and tally! Portable battery powered SSD recorder with SDI and HDMI. Rack mount SSD based deck with dual slots for infinite recording. Affordable high quality HDMI and analog for videographers. Affordable cards for SDI, HDMI and analog in SD and HD. 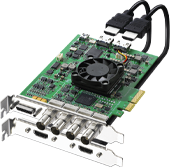 4 stream SDI/HD-SDI capture card for software developers. The highest quality SD/HD/2K 4:4:4 video card now has 3D! Highest performance SD/HD/2K and 4K card with 4:4:4 and 3D. 10 bit HDMI and analog video editing for USB 3.0! SDI capture and playback with HDMI monitoring for USB 3.0. 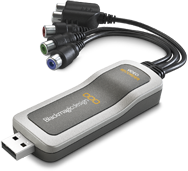 The world's first broadcast quality 10 bit editing for USB 3.0! The worlds most advanced standards converters with up, down, cross, standards conversion, noise reduction and more! Thunderbolt included! The worlds most advanced color correction for Mac OS X, Windows and Linux computers! Powerful full featured film restoration software with automatic and interactive workflows for Linux. Incredible quality broadcast converters that are simple to use! Tough machined metal converters with built in battery for live events! Super strong machined metal mini converters for live production! Broadcast quality industry standard rack converters. Broadcast quality all in one 3 Gb/s SDI routers from 16 x 16 up to 72 x 144 size! Control your Videohub router from anywhere in your building via ethernet! Build your own router with SDI or optical fiber cards for 24/7 reliability. 2D/3D HDTV and 2K monitoring using LCD displays. Route your computer monitor using SDI cables and routers! High quality LCD SDI monitoring for SD, HD and 2K! Includes ethernet for easy adjustments from your computer! Take broadcast scopes on the road for any USB 3.0 laptop! Technically accurate 3 Gb/s SDI and optical fiber SDI scopes. Capture, share and preserve your home video collection to H.264 files. The perfect way to capture SDI, HDMI or analog video to HD H.264 files. We are excited to announce the launch of the NEW DeckLink HD Extreme. This product now includes Dual Link 4:4:4 and hardware down conversion - at the same price as the previous model!!! This makes this product even better value for money and it will attract even more buyers! Please update your product order codes to the new BDLKHDE3 code and update any website or marketing information to reflect the additional features of this new product. The HDE3 is shipping immediately from today, any open orders for HDE2 will have been automatically changed to the new product unless expressly requested. Demand will be high for this card and we have new stock arriving daily into the Matrix.lt office and do not anticipate any delays in supply. Please note that the increased functionality of the HDE3 is such that we no longer include a consumer cable (with RCA phono connection). Customers could use BNC/Phono Adapters with the HDE3 or Studio cards or of course use the Intensity Pro if this is their primary form of connection. As the connector on the new HDE3 card is different, the RCA Phono cable from other cards will not work with the HDE3. The PCI and PCIe versions of this card have now been discontinued and withdrawn from sale (as matching and improved functionality is provided by the new HDE3). These two brand new capture cards have been specifically designed to replace the entire Blackmagic Design standard definition product line whilst also adding HD support, at much lower cost! Both new cards are packed with features and you will find full details in the attached Press Releases and also full technical specifications on our website at http://www.blackmagic-design.com/products/decklinkstudio/ . The DeckLink name has set the standard in World beating firsts and is the most popular range of uncompressed capture cards available today. Since launching the first DeckLink card in November 2002, DeckLink has made the Blackmagic vision a reality with hundreds of thousands of creative people using them in an almost unlimited number of different ways! DeckLink SDI and DeckLink Studio introduce even greater opportunity and will prove to be just as popular with our new and existing customers. 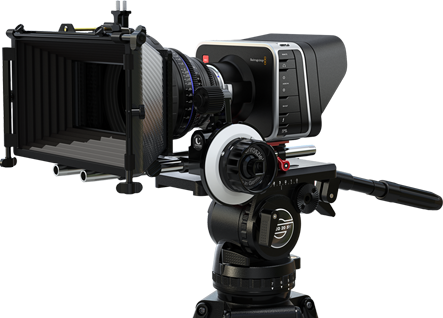 As you would expect from Blackmagic Design the quality and functionality of the products is matched by unrivaled pricing! We have worked hard over the last few years to replace our older, standard definition card family with more exciting cards that do both SD and HD. We have done that today and we have two new models that replace our entire range of SD cards. DeckLink Studio is a full 10-bit SDI card that switches between SD and HD, and also has more analog connections than any other card we have released. The reason for this is we wanted a great model that gives HD but also replaces SD cards, so it needs to connect to all the older types of analog equipment too. This card also has a built in and very high quality hardware down converter that operates in every HD format, and in capture and playback. It can be changed between letterbox, anamorphic and center cut 4:3 modes. The connections include SD/HD-SDI as well as independent analog component, S-Video and composite connections, plus 4 channels of balanced analog audio, and 2 channels of AES/EBU digital audio. The digital audio has a sample rate converter in the input, and the analog channels 3 and 4 can be changed to AES/EBU outputs so you can get a total of 6 channels of audio out for 5.1 digital surround sound monitoring. There is also an extra SD only SDI output that outputs via the hardware down converter when you are using HD video formats, or simply an extra SD-SDI output when running in SD. Because the card has a built in internal and external keyer in SD, this SD-SDI output can also output key video. DeckLink Studio's down converter is always on, so if you are working in HD, the composite, S-Video and SD-SDI outputs are always on and displaying down converted HD video. We have been asked a lot in the past for more audio channels on our cards, and we have done that with DeckLink Studio. There are still many people who need to access or work with decks such as Betacam SP that have 4 channels of analog audio. Because DeckLink Studio has 4 analog channels, you can capture and play back all these direct to the deck at the same time. DeckLink Studio also features 1 lane PCI Express so it plugs in to lower cost computers, because computers with 1 lane PCI Express slots are very common worldwide. DeckLink Studio is shipping now, and available for only $695 or €325. DeckLink SDI is a 10-bit SDI card that switches between SD and HD, and includes a reference input for genlock black-burst and tri-sync. DeckLink SDI is designed for when you don't need analog connections because you are connecting into larger SDI based systems, or you are working with digital decks. DeckLink SDI is perfect for use with SDI routing switchers such as our Broadcast Videohub, and lets you put in lots of creative workstations in large facilities at much lower cost. DeckLink SDI is shipping now for only US$395 or €325. These two new models replace our entire range of DeckLink SD cards, and I think the most exciting thing is we have packed much more technology and features into these cards and at hundreds of dollars less than our previous SD cards. This means it's going to be even easier to keep up with the latest technologies. With the DeckLink Studio model, we make it easy to work with the millions of hours of content on analog broadcast formats. It's been a lot of work to get the costs of HD-SDI technology down to replace SD, but it sure is exciting! If this is your first encounter with our revolutionary low priced products, maybe you will ask yourself if our price policy is the result of a sound and safe business model, and if this business model could work for you as well. We think it is the only future proof business model available, as long as we are combining low pricing with manufacturing of highest quality hardware meeting or exceeding the quality standards of todays broadcast industry. dramatically lowers the average costs of systems for video processing. Computerization means standardization, and in its efforts to revolutionize the video industry Blackmagic Design deliberately focuses on the rapidly evolving and maturing computer standards for video processing by building complementary video hardware that seamlessly fits into these highly transparent environments. At the outside, Blackmagic Design DeckLink video boards can connect to any existing SD or HD video equipment using any existing SD or HD video standard, while at the inside they tap into the standard QuickTime or DirectShow layers, merging the two worlds of high end video processing and standard computing. 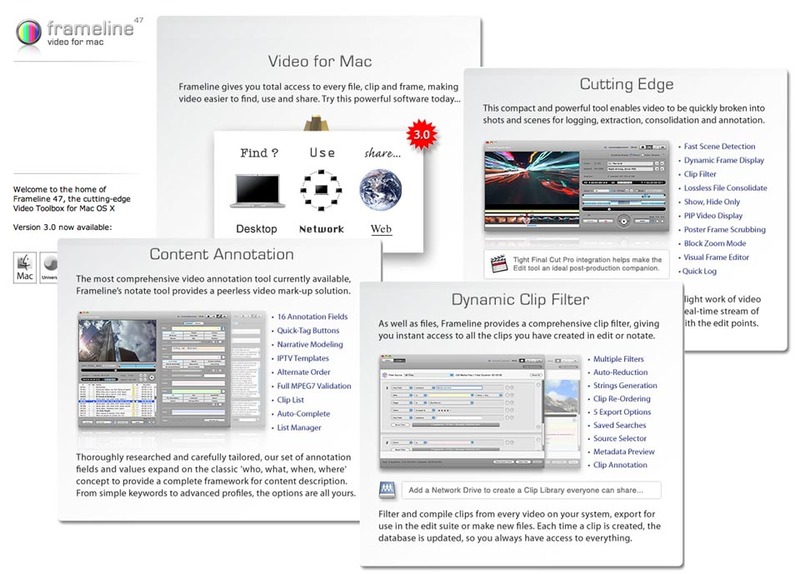 As a result DeckLink video hardware can be used in combination with Final Cut Pro, Premiere Pro, Vegas, After Effects, Combustion, Shake or any other software compatible with the open QuickTime or DirectShow standards. By consequence there is practically no limiting factor to use standard Mac or PC software and hardware to do the most demanding editing or compositing job at whatever quality level. turn leads to a very effective service and support program. Blackmagic Design writes drivers for QuickTime and for DirectShow and only has to deal with these layers. This approach saves a tremendous amount of engineering time. The hardware design can be shrinked down and optimized and the software engineers can concentrate on the drivers and the drivers alone, resulting in very fast recognition of hardware faults and very fast fixing of software bugs. whole system, and the end user has to understand this. We hope that you agree with the way we are adapting to changes in the industry and that you have the possibility to adapt with us and add value to our product. We are convinced that our lower prices generate new and larger markets in which you can capitalize on your specific added values in new and better ways. Please take time to read the info below and get a basic idea about the way we want to work together with you. You will find that we have a very straightforward and transparent policy. SDI - serial digital interface - [SDI] standard is based on a 270 Mbps transfer rate, over a single 75 ohm coaxial cable [BNC connector], up to 600 feet. Serial Digital Interface is a [standard definition] digital broadcast television standard providing a lossless digital encoding of standard NTSC and PAL formats [with embedded audio]. SDI is used in Television stations, cable channels, and professional production Equipment. SDI provides a method for transmitting uncompressed digital video, audio and other data between video devices. The most common data speed is 270 megabits per second (Mbps). However, speeds of up to 540 Mbps are theoretically possible. Standard 75-ohm cable is used. This is the same type of coaxial cable used in most home television (TV) installations. The SDI standard uses data words that are 8 or 10 bits in length. Signals are uncompressed and are self-synchronizing between the source (transmitter) and destination (receiver). Most errors caused by noise or interference can be detected, and the lost data recovered by means of a specialized code called the Hamming code. A signal in SDI can contain up to four independent digital audio signals along with the video signal. It is difficult to describe Frameline 47 in just a few words. Use it, and you will understand immediately. It is the tool that brings you total control over all your video files, wherever they are on your system or network. Frameline 47 brings MPEG7 metadata features to any of your Quicktime video files, so you will be able to spot, tag and manage all content to the max. Frameline 47 can communicate at metadata level with Final Cut Pro and Avid, making it the ideal asset management tool for these editing tools at a price level that will definitely astonish you. Frameline 47 is powerful, very powerful. If you have never worked with it, you will definitely underestimate it in many respects. Frameline 47 opens your mind and creates a new mind set and liberates your media assets for new ways of distribution. Use a Blackmagic Design card for capturing straight to Frameline 47. Immediately spot , cut and annotate your media and open it up for editing or distribution. All Frameline 47 manipulations are nondestrictive. The application accesses the files only by adding and manipulating metadata, not by chopping them into small pieces. Frameline 47 brings you full nonlinear access. Frameline 47 by Versatile Delivery Systems - Runs on Mac OSX. Revolutionary Digital Signage software from 1080DOTS. This software will go for only a few hundred bucks and bring full HD video playout from a playlist. Photoshop files with layers can be imported in one move, and all layers are placed at exactly their positions with perfect antialiased keying. Tickers can be added, and you can use RSS feeds to control them. Perhaps the best feature of the software is its capability to use Blackmagic Design hardware to do the video and audio output, making it possible to implement it in broadcast and narrowcast environments. You even can use it to key graphics over live video, making it a very flexible logo inserter, titler or sports graphics inserter. In the very near future it will be possible to remotely control DS Player. You will be able to upload and update both playlist and content using a simple internet connection. Official launch of the 1080DOTS web site will be somewhere half of October. (Leeuwarden, The Netherlands--September 12, 2008) New on the marketplace but based on years of broadcasting and digital signage experience, 1080dots is about to provide an affordable, easy to use and powerful tool for creatives who want to make their creations themselves. 1080dots is planning to introduce its first product, 1080dots DS Player, on October 10, 2008. Always wanted to be able to show off your creations on a display yourself? 1080dots has designed software to help you do just that. You can continue to work with Adobe® Photoshop® as your designer tool, drop your creations in the 1080dots DS Player and you’re ready to go. Additionally, 1080dots software is optimized for the Black Magic Decklink series of video cards. Key features of the 1080dots DS Player are: Full HD video output with multiple smooth scrolls, automatic converting of layered Adobe® Photoshop® files into a Digital Signage template, and flexible play-out management. The 1080dots DS Player is the first of three products scheduled to be released within the coming twelve months. The launch of the stand-alone player 1080dots DS Player will be followed by: The 1080dots DS Player+, which adds playlist control, content updates over the internet, and content scheduling, as well as enabling an open XML connection with any open Content Management System. 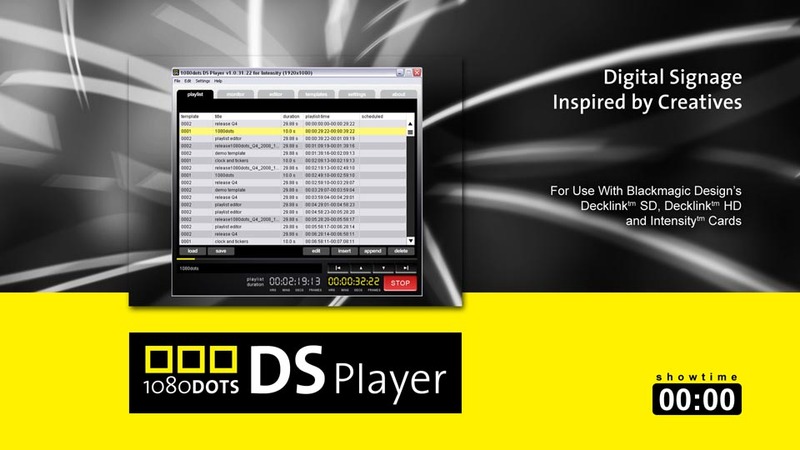 And the 1080dots DS Online will provide you with a Content Management Solution especially for Digital Signage, integrating seamlessly with the 1080dots DS Player+. “ Our mission is to enable all Video, Web and DTP designers to easily create a high quality Digital Signage solution at low costs. To achieve this, we have focused our efforts into designing the right software, providing easy-to-follow manuals and tutorials, and making available adequate support for the 1080dots community. We are convinced that we can now deliver on our promises.” said Siebolt Lettinga, CEO at 1080dots. “To keep us focused on our goal, we at 1080dots say: 1080dots, inspired by creatives”. If you have video project or question on video editing, please ask sales@matrix.lt , and Matrix.lt team will provide you information, project design and competitive prices.